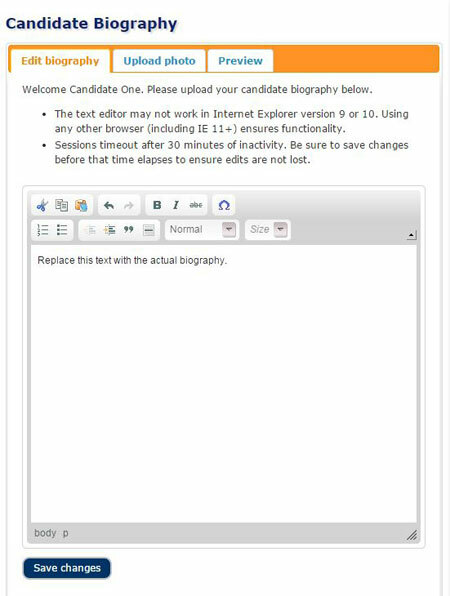 A new feature—candidate biography self service—has been added to Evote which further reduces the stress and workload on the person administering an election. Previously, when an election is set up to include candidate biographies, the individual performing that setup would have to load the candidate biographies, and optionally, candidate photos, into the system. Given that an election may be created in three quick and easy steps (fewer than that if the election’s being created from a saved template), managing these biographies would frequently be the single most burdensome part of administering an election. Relief is here. Election administrators may now direct candidates to a web page on the ElectionsOnline site where they submit their own photos and biographies. Provide an email address for each candidate. Select the checkbox for those candidate to whom you wish to send email invitations to inviting them to submit their biographical materials. Click the submit button at the bottom of that page. Clicking that submit buttom both saves the email address to simplify reminding them later and also emails the selected candidates right then. The email referenced in step four above will come from bios@electionsonline.com, so you may wish to notify your candidates to whitelist that address in their email service and be on the lookout for it before you actually trigger the email to be sent. Also, the emails provided for the candidates are not saved once the election concludes. They absolutely are not provided to any other parties, nor are they used for any other purpose other than notifying the candidates about their biographies. There are some other things you may wish to remind candidates of as you’re communicating with them about submitting biographies. Size candidate photos. Remind candidates that photos will be sized to 100 pixels wide by 120 pixels tall. When an image is submitted it will be sized by the system to those dimensions and the system may not do nearly as nice a job of it as a human would. They’re likely to get better results submitting it into the system already sized to those dimensions and Optimize Candidate Photos describes how to do that. Deadline. Remind them of the deadline to complete this task. You have the ability to specify a deadline by which candidates must complete submitting their biographies as an election property. Attempts to access the biography self service page after that deadline will not permit access. This feature permits the election administrator ample time between the deadline and the start of the election to review, and if necessary, edit, any of the biographies. Setting a biography deadline is done under the Manage election settings link. Format according to standards. The “standards” being referred to here are set by you. 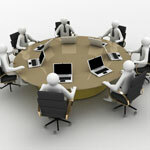 One of the recommendations for optimizing candidate biographies is to ensure all biographies are formatted uniformly. While each candidate’s biography may format nicely on its own, it may not necessarily be uniform with those of others on the ballot. To address this, you may wish to create a sample biography that serves as a model for how biographies should be formatted for your election. You could perhaps publish this on your own web site and direct candidates to it as a reference, or include it as an email attachment that goes to all candidates. A starting point for how to nicely format a candidate biography can be seen on this site’s own sample ballot. Yours may be entirely different of course, but the important thing is achieving uniformity across all biographies. Subject to editing. I highly recommend you reserve the right to review and if necessary, edit, biographies. Even if it’s just to correct typos, rather than to modify the substance, reserving this right safeguards against any unforeseen issues that may arise. As seen in the image below, the self serve page has three tabs across the top. The first tab is used for uploading and formatting biographical information. The middle tab is used for uploading a candidate photo. The final tab is where the candidate may preview how the biography will appear within the voting system. This new feature does not replace anything. Election administrators still have the ability to edit candidate biographies as has always been the case at the Manage Candidates link. But whether a ballot contains dozens, or only a couple candidates, it makes sense to offload this task on the candidates themselves. Just remember to be sure no surprises are sprung on the candidates. They will need ample time to get their photos sized and uploaded along with their biography before the deadline so adequate advance notice is key to making sure it doesn’t backfire.